The mission of the Center for Perinatal Health (CPH) is to advance newborn health by designing novel technologies customized to materno-fetal and newborn physiology. The CPH is a unique collaboration between physicians, engineers and scientists in which the focus is developing first-in-class innovative medical solutions for pregnant mothers and babies before and after birth. The epidermal electronics systems (EES) developed by the CPH are unobtrusive wireless sensor devices far superior to traditional devices with electrode placement used in routine monitoring during labor and in neonates. 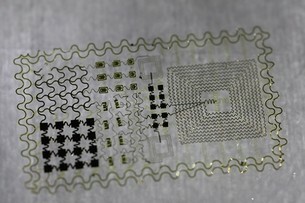 The EES come in the form of ultra-thin, flexible electronics that adhere to the skin like a temporary tattoo. 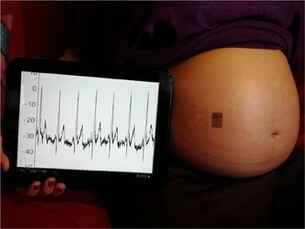 EES can detect physiological signals of the pregnant mother and fetus (e.g. materno/fetal heart rate, uterine contractions) as well as the neonate (e.g. electrical rhythms of the lungs, heart, and brain) with quality indistinguishable from traditional equipment to allow effective, non-invasive physiological monitoring during perinatal period near pregnancy and labor, delivery, and as well as the newborn child. The EES perinatal monitoring will improve the health of baby and mother. Traditional monitoring of critically ill and premature babies requires many wires and the abrasive application of sensors on to the skin of the baby, involving scrubbing the scalp and gluing electrodes to it. Application of epidermal electronics promise wireless, safe, non-invasive monitoring of the baby's health and avoids increasing the possibility of infection using traditional methods. Moreover, it allows parents to hold their baby during a critical period where skin-to-skin contact promotes a significant neuro-developmental advantage. Additionally, using medically-guided analytics algorithms to analyze the stream of data coming from the device, early complications can be anticipated and detected leading to earlier therapeutic intervention. By collecting and unobtrusively analyzing multiple streams of data from a large patient population, this center promises to advance the epidemiology of pre-term birth.